Well the mercury’s hit 30 degrees Celsius during the day, and it’s rising- the dreaded Australian summer has arrived. Australian people, particularly here in Queensland (known as the “Sunshine State”) are constantly aware of the dangers of the harsh Queensland sun - the joys associated with living under the hole in the ozone layer, writes Jess Askin. Skin cancer, de-hydration, heat stroke and exhaustion are all summer issues that Australians can’t ignore as temperatures will no-doubt reach the mid forties. What about our canine friends though? How do these plucky animals covered in thick hair or wool keep their cool through the scorching summer months? Well in the same ways we do. Sixty eight per cent of Australian households own a dog. Our most popular breeds are quite similar to that of the UK with German Shepards, Labradors, Golden Retrievers and Poodles being some of the most common pet breeds. A few you won’t see on a list in England though are the Australian Silky Terrier, and our most popular working dogs the Australian Cattle Dog (the Blue Healer), and the Australian Kelpie, both of which are the results of cross breeding with the native Dingo. As many Australian households own dogs, almost as many own swimming pools, an absolute summer essential, for humans and dogs. 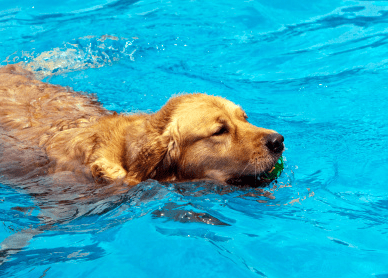 Labradors and Poodles in particular are quite partial to the odd dip in the pool. Many household dogs also use the family swimming pool as a source of drinking water. Judging by the patches of dead grass after they’ve had a big drink from the swimming pool it’s pretty obvious chlorinated pool water is not good for dogs. As much fun as diving into a swimming pool is for dogs and doing a few laps, a run and a swim at the beach is even better, provided it is a designated “Dog Beach”. As sun- bathers are not too fond of lying next to “hidden treasures” in the sand, dogs are only allowed on certain beaches in Australia. I’m not sure whether this also has anything to do with the theories of dogs attracting sharks. As skin cancer is a consideration with most people when they spend a day in the sun, we whack on some 30+ sun screen and a hat (well we’re meant to). Dogs are no exception, pet shops now sell little dog caps – with ear holes, and sun creams to put on sensitive dog noses, particularly those with fair hair and lighter coloured noses. Protecting ones eyes from the dangers of the sun’s rays is also important in Australia, so little sun glasses are also available for dogs, if you can stop them chewing them first. On a serious note though, dogs do die in the extreme heat. It is now a criminal offence in Australia to leave dogs unattended in a car without the windows wound right down, as the temperature rises so rapidly the dogs can suffocate. A man in Queensland was recently sentenced to community service after he left his two dogs in his car- within minutes the temperature rose to 60 degrees Celsius! Consequently the poor animals died. Despite this tragedy though, it’s not at all hard to be a responsible dog owner in Australia, and keep them cool. It is the responsible dog owners who never leave dogs in the car without the windows down - or preferably not at all. Water should always be available, particularly if the dogs have been running around outside, or keep the air conditioning in the house on for them. Many dog owners mean well by giving their dogs a hair cut for summer, but apparently it has the opposite effect, as the dogs hair serves as insulation and protects their skin from the sun’s UV rays. Any responsible Aussie pet owner would know to not let their dog swim in the pool or beach unsupervised; you don’t want them to drown or get taken by a shark!